Palm has rereleased the Palm Desktop for Windows that was initially billed as version 4.2. It is now called version 4.1.4E. The E denotes that it is meant for devices with the extended PIM applications. This update is identical to Palm Desktop 4.2, with simply a new version number. 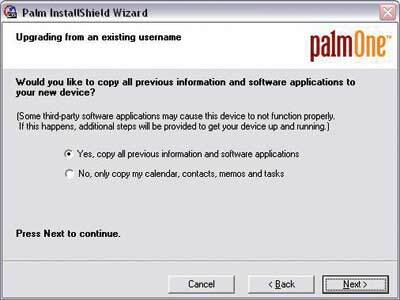 Palm Support says if you installed the version labeled 4.2, there is no need to install 4.1.4E. Palm Desktop 4.1.4E for Windows is available here. It is only compatible with the Treo 650, LifeDrive, Tungsten T3, T5, E, E2, and the Zire 31, 71, 72. I tried to install this update when it was named 4.2. In fact, I tried to install it several times. Each time I tried, the installation errored out, complaining that it did not have privelege to overwrite a certain .exe file. In fact, the file was created by the installer itself! I was not able to change the permissions of this file myself. After trying to install three times, I discovered that my existing Palm software had become balled up, to the extent that I could no longer hotsync or launch the desktop software. Is this a known problem? Does it prove that Palm Inc. is broken? There are definite problems with this update. It deletes the File Transfer program that's installed automatically with the original Palm Desktop from the CD. I tried every way to install the updated Palm Desktop - on top of the old, after deleting the old... but the File Transfer program is deleted. Even tried saving the executable in a different folder, and the pasting it back into the PalmOne folder - error message. Wouldn't be surprised if this "update" deletes other stuff too. Finally went back to the Palm Desktop version from my CD, because I need the File Transfer program. That is EXACTLY what happened to me...no File Transfer program. Plus, I had trouble hotsyncing as well....likely this was a Win XP problem. I had to undo the install by overwriting with the original CD, as posted above. And, the files it takes away as "incompatible" had been working fine for me...where would these have been moved from? (Looks like archive, not backup.) What is the difference between archive and backup, anyway? After a hard reset, where would the files be copied from? Incidentally, anyone having trouble with the multi-connector? I find that it is very sensitive, and often when I plug it in or move it slightly the connection is lost, and my PC declares it is an unrecognized device...a slight nudge, and then it is OK...even the motion of pressing the button on the chord seems to create too much motion and often will disrupt the connection. Did anyone notice the log is html now?? First, I could not find the download. Now that I have it installed (did not have the problems others have seen), the logfile is now an html files that seems to have a lot of detail. I also notice the hotsync app has better animation. There seems to be more to this than meets the eye, I would say. RE: Did anyone notice the log is html now?? The changes you mentioned come with Hotsync manager 6.0 and above. Hotsync Manager 6.0.1 first appeared with the Tungsten T5, and has since been released with the Lifedrive, Tungsten E2, and Treo 650.